This post is sponsored by Gold’n Plump. All opinions are 100% mine. 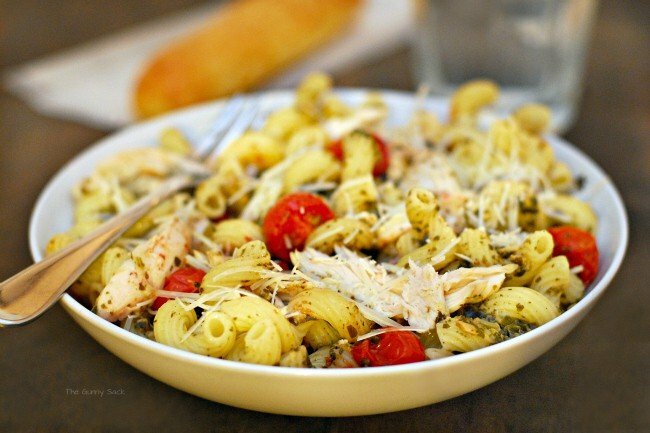 Here’s an easy dinner recipe made with Gold’n Plump (R) Seasoned Whole Chicken: Chicken Pesto Cavatappi! We just returned from our family vacation to North Carolina! It was a wonderful trip but we are having a hard time getting back into the swing of things. I’m not sure which is harder, packing for vacation or unpacking after vacation. With all that we had to do to get ready for our trip, it was difficult to find time to make dinner for my family. When things get really busy, I try to make easy meals that don’t require much of my time. 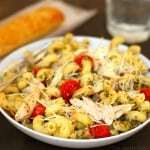 So, one of the meals we had before leaving on vacation was Chicken Pesto Cavatappi! It sounds like it would be difficult to make but I used a Gold’n Plump Whole Seasoned Chicken and store bought pesto so it was easy! Gold’n Plump is a long time favorite chicken brand in my house. When I go grocery shopping, it is the brand I buy because I know it will always turn out well. The fact that Gold’n Plump is made by a Minnesota company is an added bonus! Gold’n Plump chickens are raised the right way, by family farmers. They’re given the best care, fresh, filtered water, and locally sourced nutritious feed. 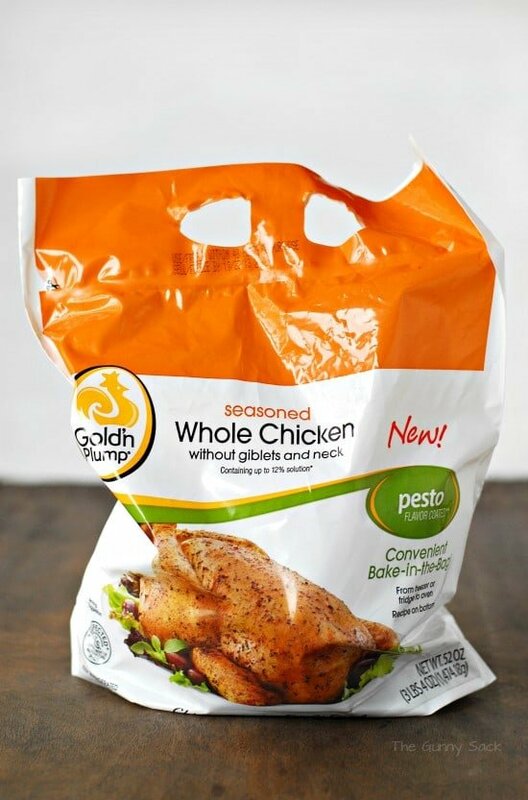 I was excited to learn that Gold’n Plump recently expanded their seasoned whole chicken line to include Pesto and Mesquite! The Gold’n Plump Pesto Seasoned Whole Chicken features a combination of garlic, basil and Parmigiano-Reggiano cheese flavors. It is perfect for pasta! 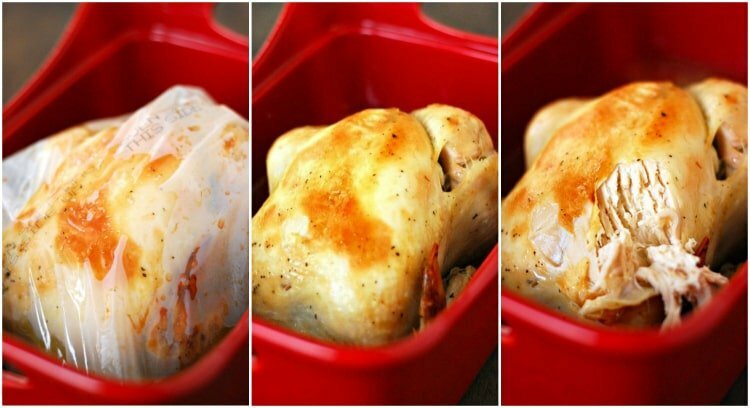 The chicken is cooked right in the bag for 1 1/2 to 2 hours. I got a lot of cleaning and packing done in those a couple of hours while our house filled up with the amazing smell of roasting chicken. After removing the bag, the chicken was golden brown and fork tender. My teen said that this chicken was the juiciest, most tender, most amazing chicken she has ever eaten! I also made some roasted tomatoes to put on the pasta. Drizzle olive oil in a pan. 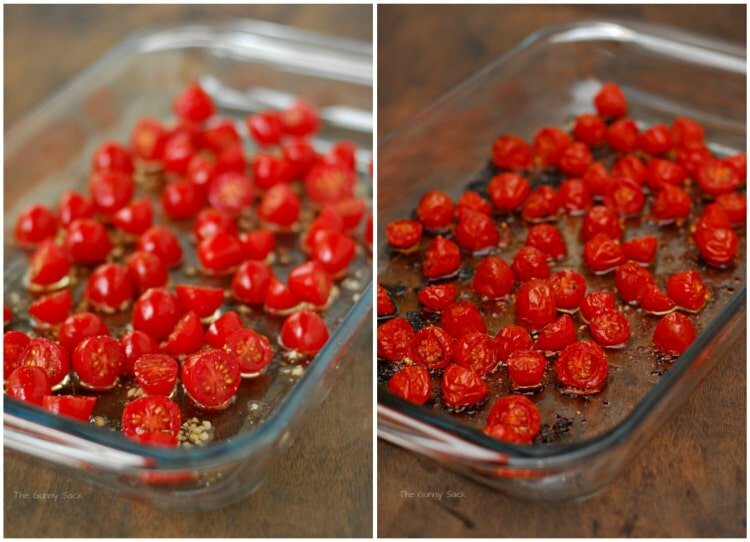 Top with sliced cherry tomatoes and sprinkle with sea salt, pepper, fresh garlic and Italian seasoning. Bake at 350 for about 30 minutes. Then, cook the cavatappi noodles. When it is done cooking, toss the cavatappi with store bought pesto. 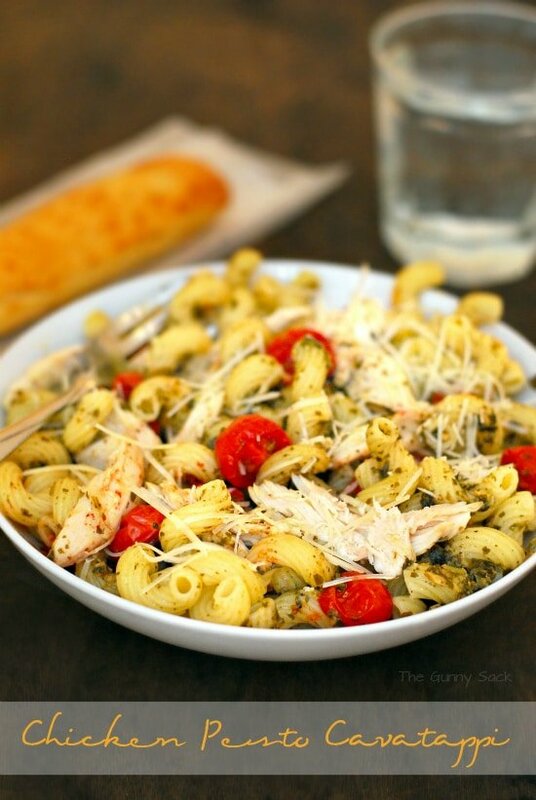 Add the chopped Gold’n Plump Pesto Seasoned chicken, roasted tomatoes and shredded Parmesan. Cook cavatappi according to the directions on the package. Top with chicken and roasted tomatoes. 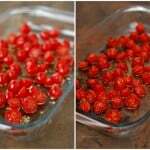 Wash tomatoes and slice them in half. Drizzle olive oil over the bottom of pan and top with slices tomatoes. Sprinkle with sea salt, pepper, garlic and Italian seasoing. Thank you, Tonia. Have a Super-Duper Week! Mmm…looks awesome! I love cavatappi…so much texture and yumminess. We are not very big eaters so there for that meal would give us enough for 1 day of left overs. Thanks Anna! I love having leftovers so that I can eat them for lunch the next day.